As someone who likes to be prepared, the thought of going a full day at London Fashion Week, without any pitstops or outfit changes, means one thing. 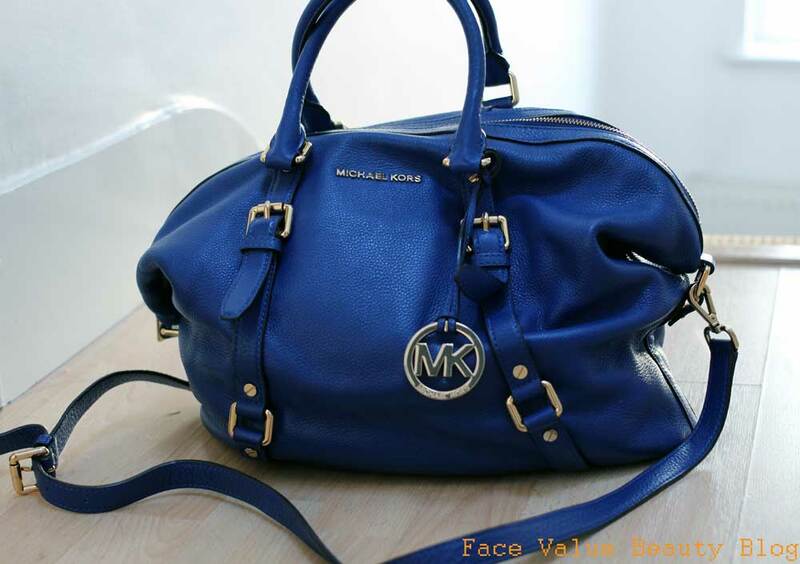 I NEED A GIANT HANDBAG. Without any chances to access my bulging suitcase and overflowing makeup bag at my hotel, my choices are limited to what’s in my hand candy. So for this weekend alone, I need to have something for every eventuality in my bag! An LFW outfit aint an LFW outfit without some big sunglasses! The compulsory companion for any street style fashionista, we have actually been quite lucky with the weather this year – today was ACTUALLY sunny AND warm. So I might end up needing these sunglasses for protection in addition to posing..
My pair of choice are foldable Wayfarer style – they fold in half so you can fit them in your pocket or that tiny clutch. Genius! If it’s going to be windy or cold, my hands and skin often end up feeling dry and tight. Burts Bees do this lovely honey & grapeseed hand cream which is full and luxurious without being too greasy. It leaves a protective feeling on the skin and smells so comforting! I’ll be rubbing it into not only hands, but also dry shins and elbows. Face Value Tip: Rub it into feet before wearing new shoes. Moisturised feet don’t blister as easily! I’ll have this Burt’s Bees cream on standby for when my shoes start to rub. 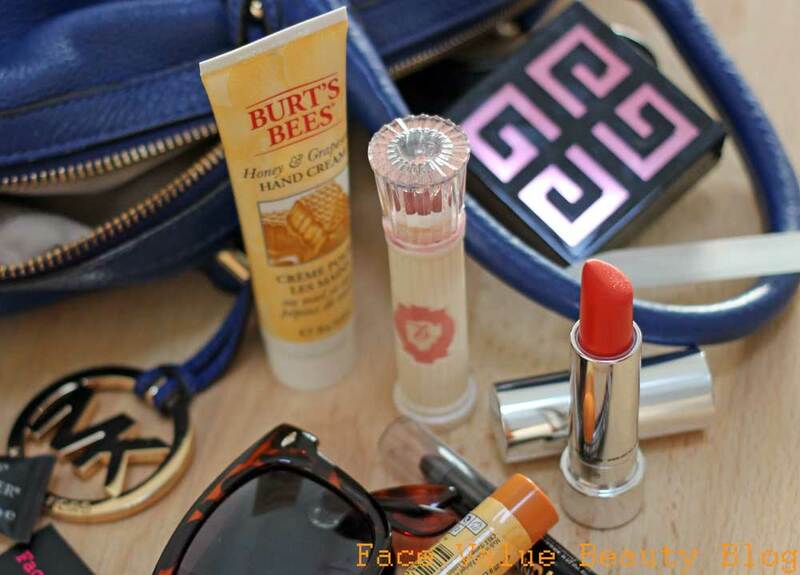 And, even better – the Burt’s Bees hand cream comes in a miniature handbag size, WITH a Burt’s Bees honey lip balm. I LOVE a miniature! Both are making it into my handbag at LFW this weekend for soft, smooth skin. The biggest challenge with a long day is how to transform yourself between day and evening events. The easiest answer to this is either amp up your eyes or, easier still, CHANGE YOUR LIPSTICK! To switch it up for a night-time event, I’ve got my favourite shade of the moment – bright orange! This & Other Stories lip color in Delaine Orange is that real Orange-Orange colour and looks incredibly edgy paired with winged eyeliner! My favourite tool for va-va-vooming up my eyeshadow is this Rimmel ScandalEyes Eyeshadow stick. It’s gorgeously smudgeable and easy to wield – I use it to line the eye on top and bottom, before smudging out with my little finger. It takes 2 minutes and really adds some drama to your daytime eyes. Skin SOS? This Amazing Concealer by Amazing Cosmetics will fix it. I reviewed it last month and it covers a multitude of sins with just a little dab. So no one will be able to tell if I’ve only had 5 hours sleep! Check out my original Amazing Concealer review here. Bye-bye Shine! When it comes to photos, my biggest dread is shiny skin! As an oily-combination skin gal, my skin has a tendency to get oily in the t-zone during the day. To combat this, I will be mattifying regularly with my current face powder of choice – Givenchy Le Prisme Visage Mat. It’s a lovely scented 4 shade powder which mattifies AND adds a very subtle radiance without looking shiny. Glass Nail File. I don’t know about you but my nails are prone to breaking and once a little crack shows, it catches in EVERYTHING. Glass nail files seal the nail by turning the nail to dust, rather than sawing it off like the old-style emery files. I use them on the edges of my nail, but also on top – this was 90p on eBay but see here for more details on glass nail files and how to get a personalised one. See ya later snaggy nails! Finally – business cards. Because I’m a REAL blogger now…! Can’t be forgetting these! Just in case I happen to bump into Karl Lagerfeld and tell him about my blog..
Do you have any of these in your handbag? If you’re a fan of being ultra-prepared, what else would you pack??! Previous Post My London Fashion Week Beauty Essentials! Next Post LFW SS15 Saturday! Photo summary.